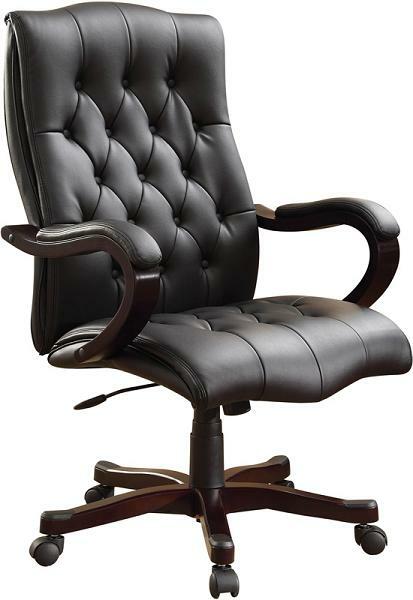 Leather executive chairs should not only be durable and functional, but they should also provide comfort and design. Executives spend hours behind their desks working, conducting meetings, and speaking on the phone so why shouldn't they do so with style and comfort while preforming these tasks? Adjustable headrests: A high back office chair featuring an adjustable headrest offer not only an added bit of design elegance, but also that extra bit of comfort during those long workdays. Not only do they adjust easily, but also they offer relief instantly. Armrest support: This functional piece takes away the stress often experienced in the shoulders and upper portion of the back from too many hours sitting behind the desk in a tall office chair. Some armrests are also adjustable for even more added comfort. Lumbar support: Sink into the seat and backrest for additional ergonomic comfort and support. On long workdays, you will feel relief as soon as they sit down in the high back office chair and resume whatever task you need to take care of at your desk. The ergonomic chairs design makes it easier to put in extra time without feeling pain and stress in your muscles. In addition to choosing support and comfort, style comes into play next. Leather executive chairs are available in an array of patterns, fabrics, and styles that fit in with their function and durability. Not only will the leather executive chairs still have their comfort, but they will clean up easily while remaining a cohesive choice in the overall decorative scheme within the rest of the office. Contact us to learn more about our selection of leather executive chairs or to place you order today with free shipping.